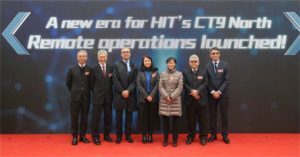 Hongkong International Terminals (HIT), part of Hutchison Ports, officially launched yesterday the operations of remote-controlled Rubber-Tyred Gantry cranes (RTGs) and automated container stacking system at its Container Terminal 9 (CT9) North at the Tsing Yi part of the Hong Kong port. According to HIT, this makes CT9 North the first container terminal in Hong Kong where all yard cranes are operated remotely and the stacking of containers at yard is fully automated. Another unique feature of this project is that for the first time in the world the container terminal was reconfigured to use the new type of equipment and stacking system while continuing its 24-hour operations. HIT pioneered a remote operation system of RMGs at its terminal back in 2012. In late 2013, HIT started to configure 29 RTGs, which had been manually operated by crane operators from crane cabins, into remote-controlled cranes. Simultaneously, it introduced an automated container stacking system. Both major developments took place at CT9 North. At the opening ceremony, Gerry Yim, Managing Director of HIT, named four major benefits of the remote crane operations at a container terminal. These include improved working environment for crane operators, increased industrial safety, higher operational efficiency and productivity and reduced carbon emissions that result in a cleaner terminal environment. Each crane is now equipped with 58 monitoring cameras and sensors to ensure full precision and enhance industrial safety in its operation. The new remote operation system is integrated with a database at the terminal to work out where and how the containers can best be grounded or stacked. Cranes under the new system are 20% more efficient and productive than manual ones. Besides, with this advanced technology, the operation of cranes – to load and unload containers from trucks – now can take place indoors, in an office setting, instead of in crane cabins, thus improving the working environment of crane operators. HIT plans to offer training opportunities for operators and organise promotion activities to attract new talents into the industry. In his speech, Mr Yim notes that Hong Kong’s container terminal industry has faced many challenges over the past few years, including global recessions, labour shortage and the decrease in container throughput. However, the transition to remote operations can enhance the overall operational efficiency and competiveness of terminals in Hong Kong, which will maintain the city’s status as a major transhipment port, adds he.